AppLocker is a great new feature that was introduced in Windows 7 that allowed IT Admins to prevent the running of certain application in their corporate environment (e.g. Chrome). However there are a number of steps and pre-requisites for this feature to work that seem to catch people up quite often. 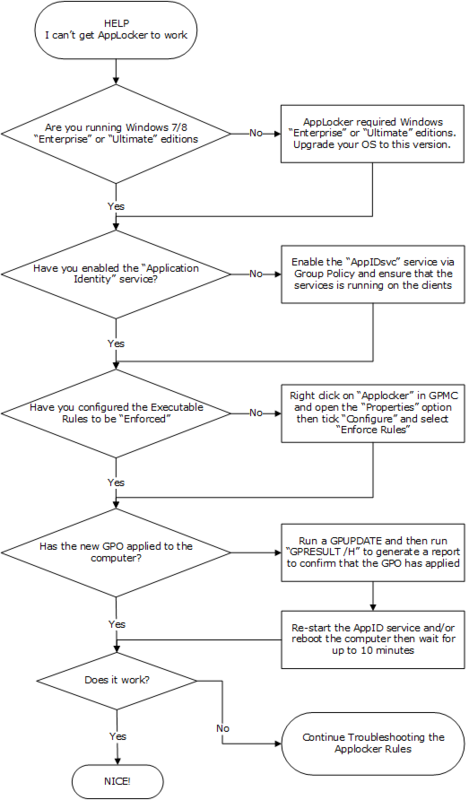 So below is a simple troubleshooting flow chart that should help you go through the common issues that happen when setting up an AppLocker rule in your environment. Note: This workflow is a check list for ensuring that your environment is configured correctly so that the AppLocker rule will actually apply as they are configured. Rule Tip: It’s also worth mentioning to NEVER just configure a single Deny rule without the “Default Rules” also configured as this will have the affect of blocking ALL programs and thus breaking your computer. Do you have any other tips for troubleshooting AppLocker? then post them below in the comments. Alan, I’m happy with Applocker, and have it running on a pilot OU. One aspect that seems a little awkward is getting notifications of software that is blocked and then as an admin, being able to add a (publisher) rule for that software into the Applocker GP. It seems like the only way to do it is to (1) get a notification from the user (2) obtain a copy of the .exe (3) scan the exe in the Applocker Rule Editor and (4) create new rule. Is there a better way? For example, a way to have all Applocker Deny event forwarded to a central place, which would also contain details of the publisher so that new rules could be made more easily? It just seems a bit awkward at the moment. Got event in Applocker Eventlog id: 8000 – AppID policy conversion failed. Status The requested operation was made in the context of a transaction that is no longer active..
Users with week accounts cannot log in, because %SYSTEM32%\USERINIT.EXE was prevented from running. I wonder if this is a good site to post an Applocker problem just in case there’s a simple solution. We’re using it for the first time; we have no prior experience. It’s configured on 2000+ servers. We are only using “8003” event-records to report violations. Example problem: we have a company policy to disallow Chrome to execute on servers regardless of whether it is installed. When it’s executed directly, the violation comes through correctly as a 8003 record. When it’s called from another program, or indirectly, it comes through as a 8002 record. Is there a simple XML configuration-line we’re missing that will trap indirect and direct executions?